Come to our information session to hear from the following Renewable Energy Cooperatives how you can invest in Renewable Energy Projects right here in Southern Ontario!!! Why not make it a GREEN WEEKEND and checkout the OSEA Green Energy Doors Open on Saturday October 3rd2015. 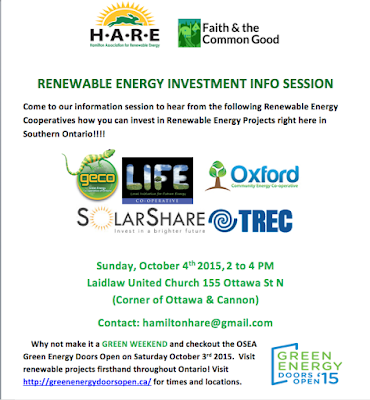 Visit renewable projects firsthand throughout Ontario! Visit http://greenenergydoorsopen.ca/ for times and locations. There's a chance you qualify for a new government solar energy program. Determine if you qualify now!